Wouldn’t it be nice if every food item came with a label on it? If only we knew how many calories were each home-cooked meal, baked good and menu item, many of us would make much better decisions. The hardest part about dieting is trying to guess how many calories are in these types of foods. We tend to underestimate calories when we leave it up to our own guesswork. We want to believe certain foods are OK to eat. Then after we talk our self in to believing we’ve made the right choice we expect to lose weight as if our guesses are always accurate. I made a major mistake one time that enlightened me on this very subject. I picked up a low-calorie snack on a road trip. I noticed the snack was a little over 200 calories. I wasn’t too thrilled about this since I try to keep my snacks to 150 calories or less but I thought I should bring it in case I got hungry. I found myself picking up the snack while I was driving along, re-reading the package over and over – contemplating whether it was worth it or not. I ultimately decided it wasn’t worth it and would prefer to eat something better later. After I ate the snack I began to feel a little guilty, second guessing my choice so I looked up the calories for that banana nut bread and found that my little ‘no sugar added treat’ had over 475 calories and 30 grams of FAT!! Ughhhhh! That’s more calories than an entire lean cuisine meal. I couldn’t believe it! I knew it was probably a little higher than my 200 calorie snack, but I had no idea it was going to be more than twice the calories. In addition I had my fat-free sugar-free latte which was 180 calories so in one quick trip to the coffee shop I had over 655 FREAKIN’ CALORIES! This little boo-boo would probably take me about 6 miles to erase! Ugh! I am sure I’m not alone here. I hear stories like this all the time in the gym, but mistakes like this can be EASILY prevented. 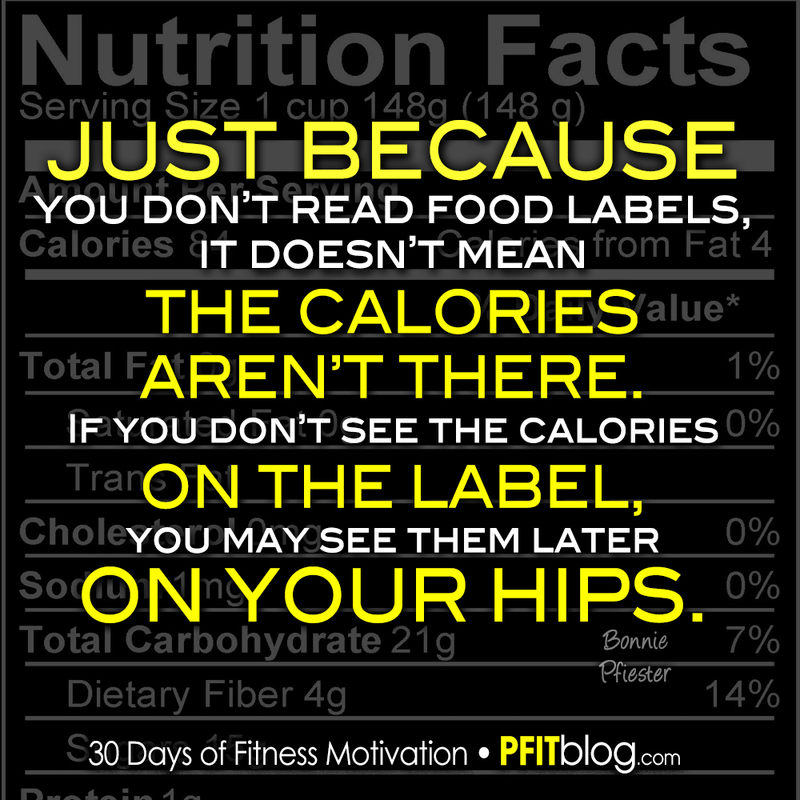 It’s simple: If you are dieting and you don’t know how many calories are in a particular food – DON’T EAT IT. It’s not worth throwing away your hard work in the gym and all your other sacrifices you make to control your caloric intake. Dieters eating food without knowing how many calories is in it is like shoppers shopping for items that have no prices on them. How in the world are you supposed to know if you can “afford” something or not? How in the WORLD are you supposed to make an intelligent decision if you have no knowledge to base your decision on? You can’t! Like Proverbs says “”One who is wise is cautious” but a “fool is reckless and careless.” I could have looked that up BEFORE I ordered it. I could have been more cautious. Sadly, most people live life with no concern for calories at all. Like me, you can fool yourself into thinking something is okay for you – but just because you don’t know how many calories is in something doesn’t mean they aren’t there. And, like our poor spending habits reflect on our bank statement – your poor choices will eventually reflect on the scale. The moral of this story: Know what you are eating, or don’t eat what you don’t know – because what you don’t know can hurt you! Don’t forget to subscribe to my blog to get more diet & fitness tips! Also, be sure to connect with me on facebook & twitter for fun fit tweets!